FRP can withstand constant exposure to the elements. The FRP grating used on the bridge is covered with a fine grit, which is slip resistant and also barefoot friendly. 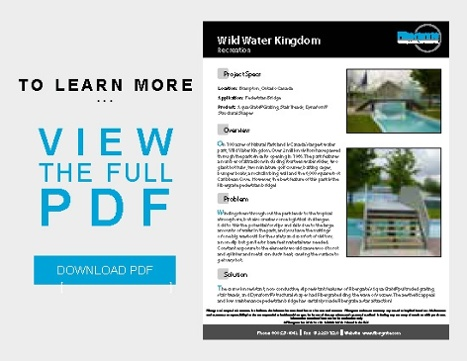 FRP requires little maintenance, even with the exposure to chlorinated water and sun. On 100 acres of Natural Park land is Canada's largest water park, Wild Water Kingdom. Over 3 million visitors have passed through the park since its opening in 1986. The park features a number of attractions including fourteen water slides, two giant hot tubs, two miniature golf courses, batting cages, bumper boats, a rock climbing wall and the 6,000 square foot Caribbean Cove. However, the best feature of this park is the Fibergrate pedestrian bridge. Winding rivers throughout the park lends to the tropical atmosphere, but also creates some logistical challenges. Add to this the potential for slips and falls due to the large amounts of water in the park, and you have the makings of one big washout. For the safety and comfort of visitors, a non-slip but gentle for bare feet material was needed. Constant exposure to the elements would cause wood to rot and splinter and metal conducts heat, causing the surface to get very hot. The corrosion resistant, non-conductive, slip resistant features of Fibergrate's Aqua Grate® FRP pultruded grating, stair treads, and Dynaform® structural shapes had Fibergrate riding the wave of success. The aesthetic appeal and low maintenance pedestrian bridge has certainly made Fibergrate a star attraction.